In January of 2018, a new club on campus began called Girls Who Code. This is a free club made up of 6th-8th grade female students desiring to learn more about computer sciences, website building and coding. The girls chose an impact project based on food insecurity and discovered that the Norwalk Area Food Pantry could use more advertisement via a well-designed website. As the girls built the website, they had different demographics of people from the Norwalk community test it and provide feedback for changes and additions to improve the site. One of these feedback opportunities occurred at the RuNorwalk event since the walk/run was a fundraiser for the pantry as well. Taking the suggestions they were given, the girls enhanced the site and while it isn’t live just yet, it’s very close to being published. 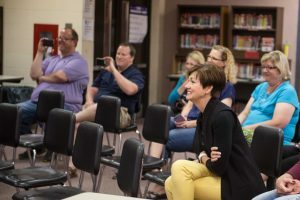 Two weeks ago, the club’s founder’s grandmother happened to be on a flight home from Washington D.C. and found herself sitting next to Governor Kim Reynolds. The two women got to discussing education, specifically STEM opportunities for young women in middle and high schools. Gov. 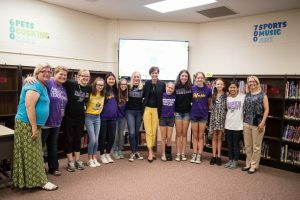 Reynolds expressed such interest in STEM and what Girls Who Code were doing for the community, that she was able to arrange her schedule to attend the girls’ last meeting of the year on Wednesday May 23, hosted in the Norwalk Middle School Media Center. When Gov. Reynolds arrived, the girls presented the history of their club, how it got started, their project for the Norwalk Food Pantry and what their future goals for the group are. Reynolds posed questions and each club member took a turn at answering and providing information to further understanding. They discussed how girls are often afraid to try STEM activities for fear of failure or thinking they’re not good at math or science. 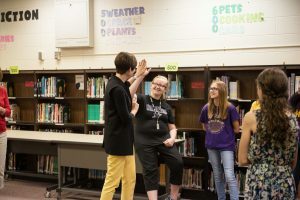 But, they shared also, that they found STEM learning includes a wide array of skills necessary that many of the club’s members could find the role within the club that best suited their strengths. Reynolds encouraged the girls greatly to keep trying new things when she said, “If you’re not failing, you’re probably not trying.” She continued to discuss with them that girls often feel they have to be perfect at whatever they decide to try or else not risk failure, embarrassment etc. The Club has two Norwalk parents who serve as the mentors and leaders of the group: Linda Sylcord and Janell Kallenbach. Both are successful women in technology careers and have guided the girls through the development of their impact project at each meeting. Gifted and Talented teacher, Teri Arbogast, serves as the Club’s Sponsor. The girls were very encouraged and empowered by Gov. Reynolds’ visit and are already working on plans to recruit more members in the fall. A special thank you to the parents who help lead these young women, Janell and Linda, and congratulations to these Norwalk students on a fantastic presentation to our honored guest!